AND on January 15 – today – when Russian invasion forces finally stormed the terminal and are fighting Ukrainian troops inside it since 7 hours now. The situation is NOT under control. It is out of control since the Minsk agreement, which has NEVER been a mutual ceasefire as agreed on, but always an unilateral truce, only adhered to by the Ukrainian side. Nobody should be surprised now. 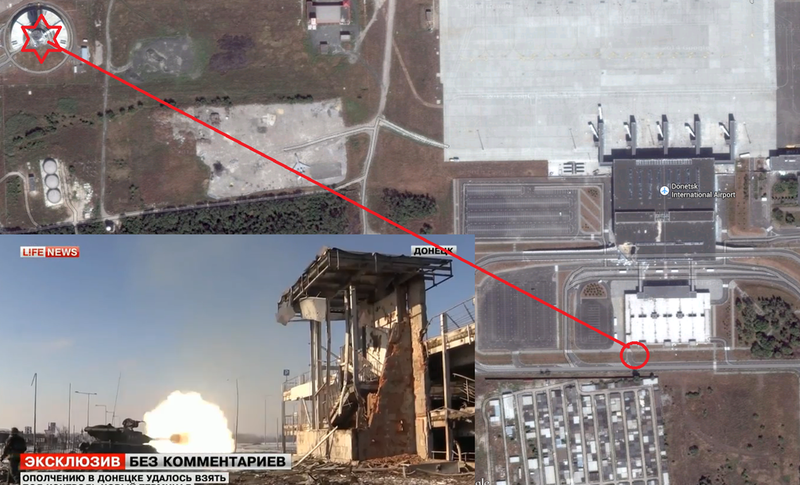 Russian invasion forces didn’t attack Terminal 1 by surprise, they advance since 5 months. Every month. Steadily and without major setbacks. This development was observed and well-documented by dozens of analysts and – of course – also by the Ukrainian army, which lost its freedom of movement / building after building / man after man in the area of the airport since September last year. However for a reason that can only be called deliberate blind appeasement policy, the Ukrainian leadership decided to let Russian forces advance over a period of about 130 days, pretending “the situation is under control”, which now should be clear to everyone, it is not. At the same time, president Poroshenko connected the defense of the airport inseparable with the defense of entire Ukraine, saying December 5 that the defense of Donetsk airport actually is the defense of Kiev and Lviv. Losing the airport means losing Ukraine. Knowing this, it is even less understandable why he accepted the Russian advance for the last 5 months, without implementing any forceful countermeasure. So his afternoon, the inevitable happened. 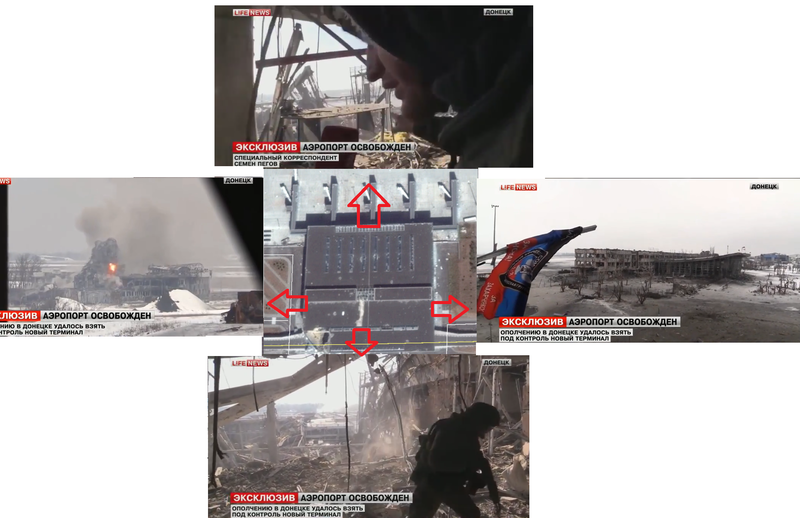 Under intense tank fire from Spartak and Vesele plus artillery and mortar support from all across Donetsk city and Makeevka, Russian infantry forces stormed the ground floor of Terminal 1, coming from nearby Terminal 2. Remember that this 50 meters away building was transferred from Ukrainian to Russian troops peacafully in early December as it was allegedly “destroyed and not usable as a strategic position” anymore. Another misjudgment, obviously. Russian troops, walking from the old into the new terminal without resistance. 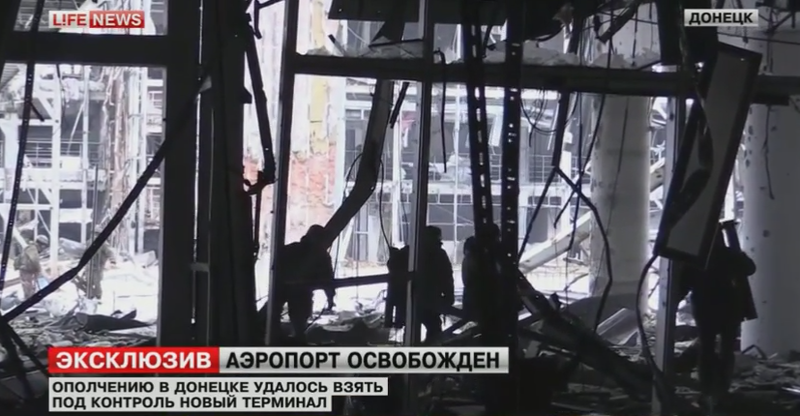 While the actual attack was not caught on camera, Russian TV published first images shortly after, showing its forces controlled practically the entire second floor of Terminal 1, offering views into all four cardinal directions. Parts of the apron, the car park, the destroyed tower and Terminal 2 are clearly visible in the footage as can be seen below. At the same time, Ukrainian forces in or near the airport reported they also fought invasion units of “battalion size” (so more than 300 soldiers) that entered the basement and the 3rd floor. Indeed Russian TV footage showed them changing levels inside the terminal, looking all across the large entrance hall of the terminal and firing up and down stairs within the building. Last but not least to enter the 2nd floor as the Ukrainian government confirmed, they must have passed the ground floor and 1st floor at some point. So in conclusion it is fair to say, battles between Ukrainian forces and Russian invaders took place all across Terminal 1 at the afternoon of January 15. But Russian troops were not just inside the Terminal. The nearest possible Ukrainian defense position is located at the ruins of the tower buildings, some 870 meters to the west. Russian tanks and ground troops moved all along south of Terminal 1, passing it and coming in a position to fire at the remains of the tower from that range. This way, they could cut Ukrainian reinforcements from Pisky and the tower – at least for a while. Russian T-64, firing at the tower ruins. Please support my 15/7 work with 1 $ per month or more. Thanks a lot! Mystified by the Ukrainian strategy. I would consider that there were incompetent generals or Minister of Defense or even President (or a traitor unknown) as plausible explanations. I have never understood the lack of reinforcement of strategically important battles. This has happened over and over, most notably in the rout of Ukrainian forces after Russian regular armed forces entered the battleground in large numbers resulting in massive UKR deaths from being surrounded and pounded in the late summer. Ukraine has men and armor and the ability to re-position them. There is something very wrong with the commanders of the Ukraine armed forces. It does not bode well for the future, Ceasefire or no ceasefire, the actions of the command have been very questionable. If Ukraine’s restraint is due to attempting to ingratiate themselves to their US and EU allies and the IMF or due to financial crisis, then it is also an implicit acceptance of Russian dominance on the ground and signals to Russian forces will face no repercussions, but may advance on Ukrainian territory without aggressive counter attacks. This is a license to seize more of Ukraine. Appeasing an aggressor NEVER has a good ending. I have to agree with your synopsis, the longer this war goes on and more and more I come to the conclusion that UKR armed forces are riddled with leaders at all levels that are complicit and actively helping Russia’s destabilization tactics. Incompetence just cannot explain the sheer amount of bizarre tactics UKR is using, the lack of support given to the defenders of the Airport is just beyond belief and now we hear the statement “The Ukrainian government prepares a #rescue_plan for the Cyborgs – presidential administration office”. I would expect a junior NCO to make better decisions than UKR General Staff have done so far during this conflict. Ukrainian state remains one the most corrupted in the world. Military force is just one part of the state machine.